SEOUL, South Korea - Divers helped by better weather and easing ocean currents retrieved 12 passengers' bodies from the sunken South Korean ferry Monday, raising the death toll to 260 with 42 people still missing. Investigators also have made their first formal arrests of people who were not on board the Sewol when it sank April 16. The three employees are suspected of negligence in their handling of cargo on the vessel. 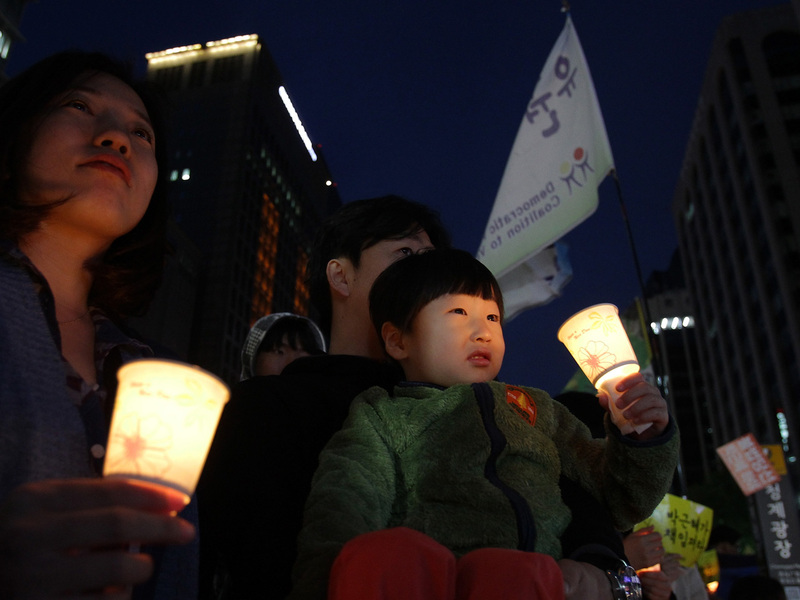 Monday is a South Korean holiday, Children's Day, but various events were canceled or postponed because of the ferry's sinking. The Sejong Center for the Performing Arts, run by the Seoul city office, canceled a handful of outdoor events and music festivals on the holiday. As of Sunday 1.1 million people had paid respects at 131 memorial altars around the nation, according to a governmental funeral support committee set up for the ferry victims. The Sewol carried 476 people, most of them students from a single high school. Only 174 survived, including 22 of the 29 crew members. In searching for the missing, divers were working their way into the last three unopened rooms, next to a snack bar on the ferry's third floor, a spokesman for the emergency task force, Ko Myung-seok, told reporters. Ko earlier said that the search team does not expect to find many bodies in those rooms as they were not assigned to the high school students who made up most of the ferry's passengers. The divers will revisit areas searched earlier, while checking other areas such as bathrooms on each floor, looking for more of the victims. Darkness, floating debris and the maze of corridors and cabins onboard have made the search difficult. Meanwhile, the joint investigation team probing the cause of the sinking formally arrested employees of the ferry owner Chonghaejin Marine Co. Ltd. on suspicion of negligence. Prosecutor Yang Jung-jin said three employees who handled cargo were formally arrested on Friday and on Sunday, while an executive of the company was detained. In all 19 people have been arrested in the investigation, 15 of them crew members accused of abandoning passengers. An executive with ties to Chonghaejin was arrested on suspicion of malpractice related to company finances. Improper stowage and overloading of cargo is suspected as a possible reason the ferry sank. The ferry was carrying an estimated 3,608 tons of cargo, more than three times what it could safely carry. A ferry loaded too heavily could lose its balance making even a small turn.